Penleys has been owned and run by Amanda Penrose and Matthew Colley for the past 10 years. You can choose to either eat in or take away; breakfasts, mains, paninis, sandwiches, wraps, salads, jacket potatoes, omelettes and a children's menu, most of which are served with our delicious homemade chunky chips. We serve exquisite coffee, a range of specialty teas and delicious hot chocolates as well as local beer, wine and soft drinks. 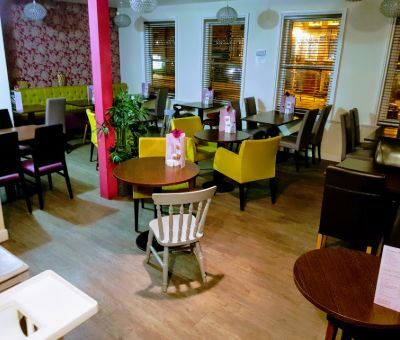 Penleys welcomes families, walkers and business delegates and our customers can enjoy a meal and/or a social drink in our tastefully decorated cafe, bar & restaurant seven days a week. Penleys also provide bespoke Outside Catering for all occasions, and will tailor your requirements to meet your event needs, from Weddings, Corporate Catering, Parties, Fine Dining - served at your accommodation, Ready meals -to eat at home, hot & cold buffets, packed lunches and posh picnics.